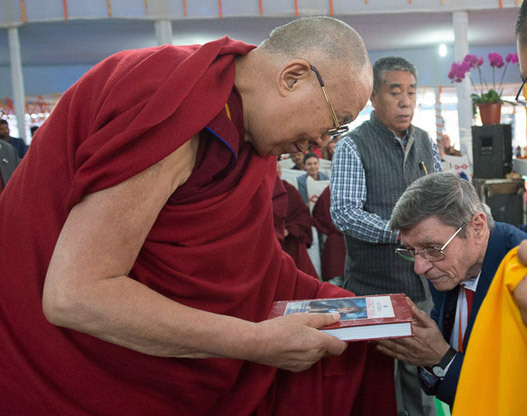 After offerings of welcome had been made, His Holiness was requested to release Giacomin’s latest book, ‘Universal Ethics’. Giacomin then gave a welcoming speech in which he explained how he had met His Holiness in Dharamsala more than 30 years ago. 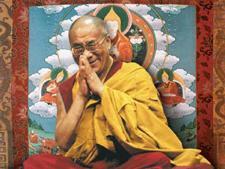 His Holiness told him then that it would be excellent if he could continue to work with education in India. Consequently, the Alice Project, focused on sustainable education and a culture of peace in an intercultural and interreligious school, was launched in Sarnath in 1994 with branches established later in Bodhgaya and Arunachal Pradesh. He said that a major aim of the project was to find a solution to the current crisis in education that results in students showing a lack of discipline, poor attention and a general fall in academic performance. One reason for this is that modern education tends to have materialistic goals with too little time given to inner values. The Alice Project schools make a point of providing opportunities for meditation and exploring ways to lead a happy life. “Good morning everybody, did you all sleep well last night?” His Holiness asked from the podium, “I hope everyone’s mind is fresh and alert. “It’s a great honour for me to be here and I’m happy to meet so many members of the younger generation, as well as my old friend from Italy who has been trying to fulfil our educational goals. “Time is always moving on; it never stands still. The past has gone. Only a memory remains, and the future has not yet come, which gives us an opportunity to create a better world. Young people like you represent the future. It rests on your shoulders and in your hands. “Basically, in order to be happy, every living thing, even these flowers, despite their having no mind, wants to survive. For human beings and animals trying to survive is a part of trying to be happy. All of us want to lead a happy life. Since we human beings have such marvellous brains we have the ability to think over the past, to learn from it and to plan for the future. We’re also able to look at reality from different angles. So, we need to use our brains to explore what brings us unhappiness and suffering and what makes us happy. “Education is a key factor because education increases our ability to think and analyse how things come about. Although none of us wants problems we face a host of them, many of which are of our own creation. Our existing modern education is inadequate for ensuring that as individuals, families and communities we are happy. This is something we need to think seriously about. One of the reasons is that our existing education tends to have materialistic goals, whereas for humanity to be happy depends on peace of mind. We have to give serious thought to how to incorporate inner values into our education on a secular basis. “These days I am committed to trying to revive ancient Indian knowledge about the workings of the mind and emotions. We need to understand better how to tackle our negative emotions through reason and analysis from a strictly secular point of view. “There is a long tradition of karuna and ahimsa in this country and one of the ways they are expressed is in the thriving of religious harmony. At the same time India’s secular stance of showing equal respect to all religious or spiritual traditions makes it a model for others to follow. “You young students shouldn’t just accept what you’re taught. You should think about it, analyse it, examine the reasons behind it, and compare it to other points of view. This was the spirit of Nalanda, the great University that flourished in Bihar. Think about how everything is dependent on other factors. In responding to students questions His Holiness pointed out that consciousness has no beginning and that our experience of happiness and suffering is due to our own karma. He confirmed that anger is the factor that most often disturbs our peace of mind, whereas karuna or compassion is its polar opposite. With regard to religious practice he said it’s fine for individuals to think in terms of ‘one faith and one truth’. However, as far as the wider community is concerned we need to accept that there are several faiths and many aspects of the truth. He reminded his audience of his admiration for India as the only country where all the world’s major religious live together in harmony. The practice of concentration and insight—shamatha and vipashyana—common to many of India’s indigenous spiritual traditions has given rise to experience in transforming the mind. It is understood that suffering results from mental afflictions like anger and hatred. Their source is ignorance and to counter that we need to cultivate wisdom. His Holiness left the stage to the students’ fulsome applause. He then drove the short distance to the Thai Bharat Society’s Wat Pa Buddhagaya Vanaram Temple behind the Mahabodhi Stupa compound. He was received on arrival by Phra Bhodhinandhamunee and Dr. Ratneswar Chakma and paused to watch graceful Thai dancers reminiscent of offering goddesses giving a welcoming performance. His Holiness turned down the offer of a ride in an e-rickshaw and circumambulated the temple on his own feet along with his hosts. He blessed the Sangharaja Kuti on the way. Inside the richly decorated new temple with its gilded statues of Buddhas and Arhats and scenes from the Buddha’s life painted on the walls, His Holiness sat with the senior monks. Verses of refuge and the Mangala Sutta were recited as the dancers performed once more. Dr. Ratneswar Chakma formally welcomed His Holiness, who he described as a model of compassion. Phra Bhodhinandhamunee declared the Thai Bharat Society’s intention to provide opportunities for all comers to learn and practise meditation in the new temple. When it came to His Holiness’s turn to speak, he acknowledged that historically the Pali Tradition derives directly from the Buddha’s first teachings, which make its followers the most senior disciples. Followers of the Sanskrit Tradition also rely on the Perfection of Wisdom teachings that came about as part of the second turning of the wheel of dharma. “I have great respect for all our Dharma transmissions, just as I respect both theistic and non-theistic religious traditions, because humanity benefits from them. Today, even scientists are showing interest in what Buddhism has to say about the mind and emotions. The knowledge we’ve kept alive remains relevant because it can help reduce our negative emotions and the power they have over us. “Discussions I’ve had with scientists have been mutually helpful. One of the few casualties has been my belief in traditional Buddhist cosmology. However, it’s clear to me that the Buddha came to teach the Four Noble Truths not to map or measure the universe. He introduced a realistic approach to suffering, an approach that is also scientific. I’d like to see scholars, scientists and practitioners gather here and sit in a circle to discuss the content of the Tripitaka, the three collections of scriptures. “We have to study if we are to understand what the Buddha, Dharma and Sangha are, what the cessation of suffering is, how to achieve it and what the path implies. Of course, we also need to understand selflessness. “In the 70s, some of our monks went to Bangkok where they learned Thai as well as participating in various aspects of practice. They’re old now, but we could send young monks again and welcome Thai monks to our monasteries. Tibetans could learn Thai and Thais could learn Tibetan. There are some Buddhist teachings only available in Pali and others only available in the Sanskrit tradition. We should engage in research and an exchange of experience. We need closer relations and a common effort to present Buddhism in the 21st century.